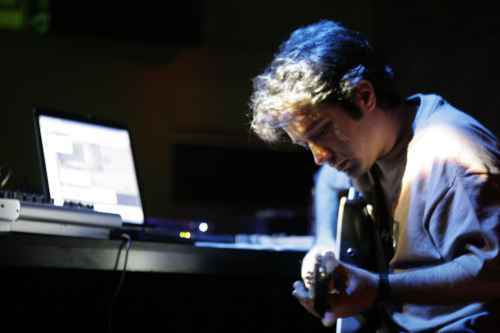 Turkish musician and composer Erdem Helvacioglu has an international reputation for his electroacoustic music, and is perhaps most well known for the way he combines solo guitar with live electronics. As well as releasing critically acclaimed albums, Erdem composes for film and theatre, and has been part of the lineup of Turkish punk band Rashit. Erdem is a long time user of AudioMulch, and we were keen to learn more about how he uses it. How does AudioMulch fit into your sound design and production process? Erdem: I can say that Audiomulch is one of the most important sound design tools for me. I use it in every aspect of my work: film music, electroacoustic composition and pop music production work. For pop production, I process things like the drum tracks and vocals in AudioMulch and export these new processed files for use in the final mix of the song. For my film and electroacoustic work, I create more complicated setups. These setups may involve the use of tens of plug-ins at the same time and automation of hundreds of parameters. Similar to my pop work, I export these sonic creations to be used within the final mix. How do you use AudioMulch in live performance? I use Audiomulch with my acoustic guitar setup. This setup includes an Ovation custom legend 1869 electric-acoustic guitar, a Sansamp acoustic DI, a Carl Martin compressor, a Behringer FCB 1010 MIDI foot controller, a TC Electronic Fireworx hardware multi effects processor and a small analog mixer. The guitar signal is routed to the compressor, the acoustic DI and then finally to one of the mixer channels. Through the two aux sends, this signal gets routed to AudioMulch and TC Fireworx. The outputs of AudioMulch and the Fireworx get connected to the mixer too. This allows me to send these two different systems to each other for more interesting sonic results. I have created a very complex mixing, routing system within AudioMulch. This mixing system includes a total of 48 (and sometimes more) different channels of FX that are all very different from each other and all routed to each other in a special way. These FX include the DLGranulator, FrequencyShifter, Nebuliser, DigiGrunge and lots of VST plug-ins. Besides this complex routing system, I also control selected parameters in real-time either with a MIDI controller, the Metasurface, with the mouse or as automations in the timeline. What are your studio and live performance setups? Besides my software setup, I have a big collection of hardware equipment. As a composer, I definitely believe that one should have access to both unique hardware and software gear. I have many electric guitars, a unique handmade Togaman violguitar, many analog pedals including the whole Moogerfooger collection, Zvex, MXR and Electroharmonix pedals. For hardware FX units, I use the Eventide Eclipse, TC Electronic Fireworx, Lexicon MPX100, Lexicon Vortex and Korg Kaoss Pad. For synths and drum machines, I use the Access Virusb, Waldorf Blofeld, Korg n5, Korg er1 and Machine Drum. I use Cubase, Soundhack, Metasynth, Soundforge besides AudioMulch. For my studio work, I use a combination of this equipment with the emphasis being on AudioMulch for creative sound design. For the live acoustic guitar and electronics work, I use the setup described above. I also have a live guitar and electronics setup that is completely hardware-based. This setup includes my Les Paul electric guitar, a Marshall JMP-1 pre-amp, an Eventide Eclipse, a TC Electronic Fireworx, a Lexicon MPX100, an Eventide TimeFactor and various analog pedals. I have a large collection of instruments including an Iranian santoor, a Turkish bowed tanbur, an ud, a lapsteel, a mandolin, and various percussion instruments that I record for my film work. I recently bought a new violguitar built by Jonathan Wilson in LA. This is a futuristic, hybrid instrument that is played by a bow. It is one of the most inspirational instruments that I own and it is such a great tool for creating interesting textures and film work. Do you have any favorite VST plug-ins? This is a hard question to answer since I use so many different VST plug-ins and most of them are unique in their own way, but I guess I can state that some of my favorite VST plug-ins are Delaydots Spectral Pack, Antares' Filter, GRM Tools, Fishphones, Izotope Spectron, PSP plug-ins, Soundhack Spectral Shapers, AbVST and plug-ins by Smartelectronix. Can you describe some of the techniques you used in your albums Altered Realities (New Albion, 2006) and Wounded Breath (Aucourant, 2008)? I used two different approaches for these two albums. Altered Realities is an album of solo acoustic guitar and live electronics, whereas Wounded Breath is an album of electroacoustic tape pieces. For the Altered Realities album, I used the complex routing, mixing setup that I described above. Many of my guitar and electronics records are based on either long or short loops that control the main structure of the pieces. But on Altered Realities, there is no use of loops at all. Rather than using loops, I tried to create long textures that change, evolve over time using many different FX parameters and complex automation. On Wounded Breath I used a similar system, but involving exporting sounds for re-processing and final mixing. The sounds I created were mostly long textures that evolve spectrally over time. The single hits and short sounds were created and processed within Cubase. For a single sound, I would sometimes use so many different contraptions and automations that the CPU usage on my machine would hit 90%! Creating the pieces on the Wounded Breath album live would mean a hundred MacBook Pro machines running simultaneously at max CPU! So my process was iterative: after creating the textures I would mix a part of the piece, export that segment and process it again within AudioMulch. The piece “Below The Cold Ocean” on the Wounded Breath album is a very good example of this working method. This piece also received a prize at the prestigious Luigi Russolo Electroacoustic Music Composition Competition. What are the main features of AudioMulch that you tend to use? The main features of AudioMulch I use are parameter control and automation, the Metasurface, the LoopPlayer, FilePlayer, FileRecorder, DLGranulator, DigiGrunge, FrequencyShifter, Nebuliser, BubbleBlower, and occasionally the LiveLooper for looping some of the FX returns. Do you have any favorite contraptions or techniques? My favorite contraption is the DLGranulator. It is a great granulator, and I have used it for both my live electronics and electroacoustic sonic design work. If you had control of Ross' development schedule, is there any feature you'd make him add to AudioMulch? I would very much like Ross to add LFOs (low frequency oscillators), various envelope and sequencing contraptions that can be assigned to any parameters. In combination with the automation and the Metasurface, this would make AudioMulch an even greater tool for sonic processing in real-time. Also, it would be great if AudioMulch could be used as a VST plug-in within sequencer programs such as Cubase and Protools. That way we could have the option of using the program either as a stand-alone application or as a VST plug-in within those sequencers. Besides these, I also definitely need a feature where we would be able to create sub patches. My patches are so dense; sometimes I begin to lose sight of what is connected to where. Being able to create sub patches would really help users like me who create dense patches with lots of routing. What do you mean by "simultaneously" here? Does that mean you spend time jamming with AudioMulch (or other software) with your guitar as live input? Or some other process? I mean that when I start composing a live electronics piece, which may involve any kind of instrumentation, I start to write basic ideas, harmonies, and techniques on paper while creating the electronic part too. The live electronics part that I create within AudioMulch involves not just various contraptions and routing systems, but also complex automation of various FX parameters. In that sense, besides the written score, the mixing environment and the automation timeline become my score. Just as how a composer writing a symphony would be aware of every detail on the score, I also need to be aware of every detail within the FX parameters and the automation timeline in AudioMulch. With the help of this system, I can create sophisticated pieces in which textures evolve spectrally over time.